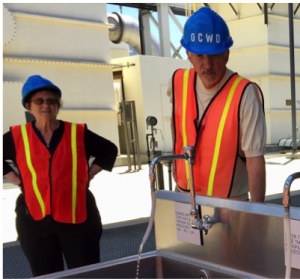 Last year, the members of the WQ&HC had the pleasure of touring Orange County’s world-renowned Groundwater Replenishment System (GWRS) in southern California. It was a memorable trip, concluding, naturally, with a taste test of the finished water. The high-tech water treatment facility includes microfiltration, reverse osmosis (RO), and ultraviolet (UV) light with hydrogen peroxide. But here’s what I remember about the taste—nothing. It tasted, more or less, like any other treated drinking water I’ve had. And according to the results of a newly published study from a team of University of California, Riverside (UCR) researchers, my consumer experience was not unique. Years of prolonged drought in California continue to build momentum for the use of recycled wastewater. Six water agencies in the state already support the need for recycling and use drinking water produced through an approach called indirect potable reuse (IDR or IPR1). This includes the Orange County Water District, which provides “high-quality water that meets and exceeds state and federal drinking water standards” for nearly 850,000 residents.2 Other communities around the world are also confronting the technical and sometimes more daunting public perception challenges associated with IDR/IPR.3 According to Daniel Harmon, a UCR graduate student in psychology and the lead author of the new study on public perception, “It seems that this term [wastewater], and the idea of recycled water in general, evokes disgust reactions” but “It is important to make recycled water less scary to people who are concerned about it, as it is an important source of water now and in the future.” Recycled wastewater treatment technologies will be increasingly important to the world and have been heralded as critical to achieving the United Nations Sustainable Development Goal 6 (SDG6), “Ensure availability and sustainable management of water and sanitation for all” by 2030. To date, the safety of highly treated recycled wastewater has been the focus of most research, but its taste is rarely highlighted or compared to more conventional options—at least not in a scientific, blind taste test. The UCR study included a diverse group of 143 undergraduate students who were asked to compare (1) “IDR-treated tap wastewater,” including RO; (2) conventionally treated tap water (from groundwater); and (3) commercially bottled water treated with RO. The waters were presented in identical clear, unlabeled plastic cups; thus, participants were “blind” to the source of the water (as opposed to being blind-folded!). Each participant ranked the taste of all three samples from one to five (texture, temperature, smell, and color were similarly ranked). The UCR team also assessed factors that may influence taste perception, including genetic differences in taste sensitivity using the highly familiar, “tried-and-true” measure of sensitivity to paper strips coated with the chemical phenylthiocarbomide (or PTC). Those who found the strip’s taste to be bitter were considered to be more sensitive to taste. The students also took a quick personality survey from which they were grouped on a scale ranging from “Neuroticism” (referring to anxiety and insecurity) to “Openness to Experience” to assess personality traits that may help determine water preference. At the outset, the UCR team hypothesized that the three waters would score equally. In fact, one emerged the least preferred—tap water, possibly because it had “higher pH…and lower concentrations of Ca [calcium] and HCO3−,” or bicarbonate. Sensitivity to PTC had no effect on the results of the blind taste test. Perhaps not surprisingly, participants more open to new experiences liked the three samples about the same with no clear preference. However, those scoring higher on the personality scale for nervousness and/or anxiety in the study expressed a preference for IDR and bottled water, and were more negative about the taste of the relatively mineral-rich tap water. The UCR researchers suggest that favorable comparisons between RO-treated IDR water and bottled water may help make consumers become more agreeable to drinking recycled wastewater in the future and help address personality traits that may encourage or discourage its consumption. Indeed, determining how to convince those “disgusted” by the mere thought, let alone the actual reality, of drinking recycled water could be key to maintaining adequate water supplies for growing Californian and global populations as we proceed further into the 21st century. Linda F. Golodner is President Emeritus of the National Consumers League and Vice Chair of the Water Quality & Health Council. Click here to download this article. 1 Blending of highly treated, recycled wastewater into a natural water source (e.g., groundwater basin) for subsequent use as drinking (potable) water after further treatment. The term “toilet-to-tap” also (derisively) refers to indirect use of recycled wastewater. For further information, see this glossary of water reuse and related terms. 2 GWRS: Groundwater Replenishment System. Technical Brochure, Online, available: https://www.ocwd.com/media/4267/gwrs-technical-brochure-r.pdf. 3Warren, J.D. (March 13, 2018). “Toilet-to-tap: Gross to think about, but how does it taste?” Online, available: https://ucrtoday.ucr.edu/52156.